The two sides that finished 3rd and 4th in La Liga last season met at La Roselada on Saturday evening. A close, edgy game was anticipated. Malaga had no wins in their last four games and had failed to record a victory in a league game following a midweek Champions League fixture. Their opponents, Valencia, were undefeated in six games across all competitions although that masked their inability to win a league match away from home since last March. A tense game should have been the outcome. Two teams buoyed by qualification for the knockout stages of the Champions League and contesting the final Champions League qualification spot. It may seem strange to state such a view so early in the season but given that Barcelona and Real Madrid will take the first two spots and Atleti appear to be on the way to 3rd, it leaves a clutch of teams contesting 4th place and the final spot. Instead what we witnessed was a one-sided contest. Malaga started brightly, took an early lead and only poor finishing stopped this contest been over much earlier than it should have been. Pellegrini named the same starting eleven that had faced Osasuna last weekend, drawing in the process. Qualification to the knockout stages of the Champions League enabled the Chilean to rotate his squad for the away game against Zenit enabling key players to get some much needed rest. Pellegrino made a number of changes to the Valencia side following last week’s home win over Espanyol. Some were enforced whilst others were made for tactical or technical reasons. Soldado was suspended and replaced by Valdez. Barragan continued to deputise for the injured Joao Perreira at right back. Ricardo Costa was recalled to central defence in place of Victor Ruiz whilst Guardado was pushed forward to left midfield and Cissokho came in at left back with Jonathan Veira dropping out. Veteran midfielder Albelda was replaced by Gago. The final and most significant tactical change was the replacement of Jonas as the support striker by Banega. Manuel Pellegrini favours his teams to be compact and dominate possession with short passing triangles always providing options to the player in possession. This Malaga side are not yet as fluent as his great Villarreal team but there are some key similarities. Malaga set out as a 4-4-2 with both wide players comfortable cutting infield and the full backs overlapping to provide width. Indeed, Eliseu and Gamez both provided an assist in this game. The use of Joaquin as a central striker was very interesting. Although a right winger for much of his career, the ability of Joaquin to pull wide from a central starting position enables the “wingers” Isco and Portillo to drive diagonally inward to the space being vacated. It’s a system that Pellegrini used to great effect at Villarreal with Rossi and Nilmar providing mobility and width in the striking positions. If Pellegrini and Malaga have a clear identity, Pellegrino and Valencia are still searching for their identity to a certain extent. The key tactical move for Pellegrino was the replacement of Jonas with Banega. This was a clear attempt to gain more possession of the ball and retain it. It was a move that, whilst looking correct in theory, failed to pay off in practice. Valencia were not dominating possession, not controlling space and not counter attacking. It was a listless performance. Despite the inability to demonstrate any clear personality during the game, Valencia recorded a high pass completion rate with 304 successful passes from 392 attempted. As ever with stats though, the context is important. Too often the passes were horizontal and in safe areas of the pitch. Malaga may have had a marginally lower pass completion rate of 75% with 315 successful passes from 422 attempted but often these were penetrative passes being attempted. Malaga were brave in their attacking play. The number of successful passes in this issue is not as important as the location of the passes and direction. 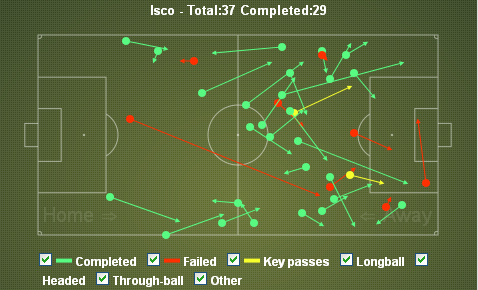 Isco starts on the left side of midfield but the location of passes demonstrates his movement across the pitch with the vast majority of passes being in the opponents half of the field and moving forward. This contrasts sharply with Banega. Designed as the central point in the attacking trident behind Valdez, Banega constantly dropped deep searching for the ball, in the process isolating Valdez. Too few of his passes were vertical identifying the inability of Valencia getting players forward in support of the attack, with Guardado and Feghouli very quiet, and the inability to search out Valdez accurately. One of Valdez’s key attributes is his aerial ability yet Valencia only attempted eight crosses in the entire game and only three of these were successful. A criticism of Valencia in the past has been that the team are two disconnected units, the defence and the attack with Banega being the key to link these elements. At La Rosaleda, there did not seem to be any attack to speak of. Valencia had only one of their five attempts at goal on target. Banega was supposed to help Valencia retain possession and hurt Malaga yet whilst he achieved the former he badly failed with the latter. Which this may sound harsh on the midfielder, his performance was not aided by the general poor play of Valencia with sloppy passing and positional errors compounded this. Perhaps to much weight was placed on the shoulders of the player? Malaga started the game very brightly and immediately pushed Valencia back into their own half. The opening goal arrived in the 7th minute when Barragan failed to clear a deep cross into the penalty area. Eliseu collected the loose ball on the left wing and passed to Portillo who was standing in space at the edge of the penalty area with time to curl the ball into the net. Portillo had drifted into this position from the right yet nobody had picked him up. Tino Costa had dropped between the centre backs at this stage. Why he had moved so deep was odd given that Malaga had few players in the penalty area. The lethargy which was engulfing Valencia continued. Following kick off, Portillo won the ball back almost immediately. There was no response from Valencia to going a goal behind. One of Malaga’s biggest problems last night was the inability score the second goal and provide a degree of breathing space. 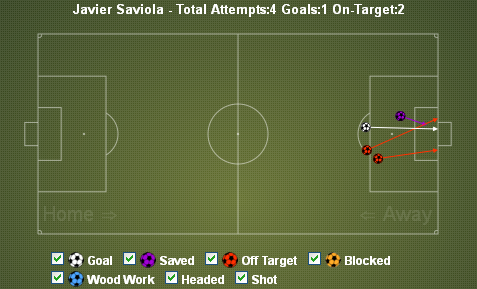 Although Saviola scored the crucial second goal in the 74th minute, he had chances much earlier which he failed to convert. Malaga were finding too much space between the Valencia lines but were unable to take any of the opportunities that arrived. Malaga had 22 attempts at goal but only six hit the target. Is Saviola the right man to lead the Malaga attack? He is mobile and can move laterally so is a good fit for the system but his goals return is poor. El Conejo has never been the most prolific of strikers but he is Malaga’s top goalscorer with four league goal from his ten appearances. If this season is going to be successful for Malaga, they need to continue to share the goalscoring burden across the entire front line whilst also hoping that the likes of Eliseu can also continue to weigh in with a goal or two. Two late goals followed and provided a scoreline which was more reflective of the game. Santa Cruz poked the ball home from close range following Jesus Gamez’ deflected shot. Again, Santa Cruz was in space and unmarked. The fourth and final goal was a 20 yard strike from Isco into the bottom corner. Gathering possession some 25 yards out, Isco had time and space, a constant and concerning theme from the Valencia perspective, to move forward, compose himself and shoot. A former Valencia defender, Pellegrino will need to examine the shape of his defence positionally. This was from an early stage with Barragan continually moving too close to his central defenders and allowing Malaga freedom on the left. This manifested itself in the 18th minute when the entire defence shuffled over and nobody was near Eliseu when Malaga switched play. The full back managed to have a shot at goal. 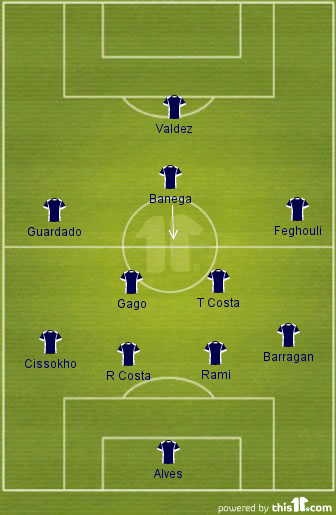 Shortly afterwards, Barragan was caught upfield and Isco was able to counter in the available space. Whilst Malaga were pressing their opponent intelligently when the opportunity arose to win the ball back and dropping off when Valencia had more controlled possession, the visitors seemed to lose all shape at times. Their pressing was erratic and too many players became involved leaving space and gaps elsewhere. The short passing movements from Malaga were neatly aligned with longer passing when appropriate. It enabled them to open up space. Only the wasteful finishing from Malaga, highlighted above, prevented the visitors from conceding further before the interval. Valencia made 31 successful tackles form an attempted 37. 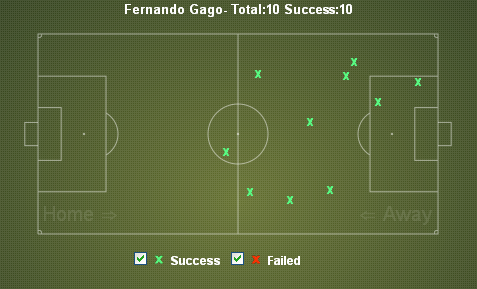 Fernando Gago had 100% success rate with his 10 tackles. The Argentinean made a significant contribution to his side defensively and in various positions but too few of his team mates matched his efforts either in determination and workrate or quality. That he made so many tackles all over the pitch highlights his workrate but he should not have been required to make so many tackles in all over the pitch. What were his team mates doing? An emphatic victory for Malaga and a crucial one at that. With Atleti, Barcelona and Real Madrid seemingly securing the top three positions, the race for fourth involves a number of teams. Malaga have given themselves a four point lead over one of their main rivals and returned to winning ways after a relatively lean spell in the process. Having gone six games undefeated in all competitions, the nature of the loss to Malaga will arguably concern Pellgrino more than the actual defeat itself. Valencia were extremely poor and offered no resistance to their opponents. The poor away form must be addressed. The Mestalla is becoming a fortress once more for Los Che and with La Real up next, a team with an almost equally poor away record, Valencia have the ideal opportunity to bounce back.